...because I can't imagine anyone younger than ninth grade would be the slightest bit interested in Dante's Inferno. 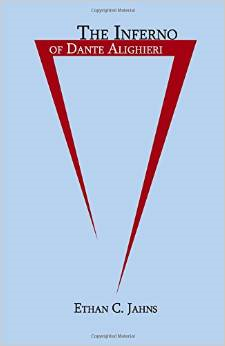 I asked him about the cover, and he says the red triangle represents the cone shape of Dante's Hell. You can buy it on Amazon for $10.80. Remember that if you look for it, search "Ethan C. Jahns" in the Amazon search widget to the right near the top of the blog. Any time you search using that app and buy something, Amazon sends some of the profits to my blog. Anyway - that's really cool, Ethan! Way to go! Amazon really needs to quit with that "You may also like..." bar. It's always right - I always find something I really like. I decided to browse it as my reward to myself for getting my papers all turned in on time. This time it showed me The Selection series by Kiera Cass, the first book of which is call The Selection. The basic storyline is that a prince has come of age, and a competition, the Selection, is held among thirty-five women from the kingdom. The main character is a girl called America Singer, who is already in love with someone from her home, which, of course, leads her to some very difficult choices as she has to choose between the print and her childhood love. At the same time as the selection, two groups of rebels threaten the palace, and no one seems to know what they want. I read through the first book in one sitting, and it left me with a deep impression of Ms. Cass's writing skill. She has an exciting style of writing and a gift for connecting with the reader. America is an intriguing, likable character who, I think, the majority of young women can relate to. I don't think many young men would find this book very interesting, but then, I don't think they are the intended audience. Beyond a doubt, any high school or college girl will find something in this novel to connect to, or be inspired by. Definitely five stars! And since it's a series, I expect I'll get the next one, too. It snowed for most of all last week, but it only just started sticking Saturday night. I didn't notice it until I was getting to some household tasks. I was taking out the garbage, and when I got downstairs and opened the door, there was a carpet of white at my feet. It was after 11 at night, but I ran back upstairs, got my warm winter clothes and went outside to enjoy the snow for a while. It's still around today, much to my delight. And the first snow means that it's time to change my blog's background. Thanksgiving is in less than two weeks! Nathan'el, as some may recall from Pasadagavra, is the adopted son of Ol'ver and Ran'ta. He's grown up with something of a fighter's mentality that doesn't really match his parents' temperaments. Fal'ne is his little sister, of whom he and everyone else is very fond. Unlike Nurida and Conch, Nathan'el already knows a lot about living and fighting in the wild. He is also very intuitive to when something's wrong. Fal’ne the mouse maiden stepped lighted-pawed beside her father and elder brother. They were on their way to Graystone! Oh happy day! Her father had two good friends in Graystone, and her mother had another. Her father had promised them for a long time that they would visit Graystone, but only a few weeks ago had they been able to. First they had taken a boat down the Keron River, well guided by a river otter named Kyka. Kyka had been delighted to have an excuse to sail on the Keron, but he had been extremely wary. They had not encountered the wild tribe of the Keron Mice and soon had gone ashore to travel on foot the rest of the way to Graystone. Fal’ne stopped dead and twirled on one paw. Her father stopped too and threw an affectionate paw around her shoulders. Fal’ne let out the breath she had been holding. Not too many weeks before they had set out, her mother had disappeared. Her father never said much anymore, nor did he smile so often. When he did smile, it was always because of Fal’ne or Nathan’el. He never laughed anymore. That was another odd thing that had happened since Ran’ta’s disappearance. Ol’ver always seemed to be looking back over his shoulder, as if he were afraid of being attacked. They ate and camped only in places well-hidden. But Nathan’el tried very hard not to let Fal’ne notice his odd suspicion. They found a dip in the ground, shielded by fallen logs and huge clumps of salal bushes. Fal’ne dug into her pack and found some cold bread, while Nathan’el built a small fire and Ol’ver handed around wooden utensils. Fal’ne also found some cheese and mild, watered wine, and they had a fine dinner—at least as fine as can be had on the road. Afterwards, Fal’ne fell asleep, leaning against Nathan’el. Ol’ver, too, fell into oblivion, exhausted from the day of travel. But Nathan’el stayed awake. His mind was, as it had been for weeks, on his mother. Nathan’el had been watching his father almost unceasingly since Ran’ta’s disappearance, hoping to hear a clue about what had happened to her. After two weeks of searching and not finding her, Ol’ver told his children she’d probably lost her way in the woods and perhaps died of starvation. And yet, he didn’t act like it. He acted as if he knew something else. So far, he’d said nothing more, but Nathan’el thought, It’s just a matter of time. Your Life Begins When You Begin It! Disclaimer: I am making no political endorsement. I am merely using one girl's story to illustrate a point. Yesterday America went through a regular explosion known as an"election." The part of this election that I liked the best is the story of Saira Blair. She ran for a seat in the West Virginia legislature, and she won. The best part? She's eighteen. Yes, you read that correctly. She is eighteen years old, and she won an election. Now, of course, she gets the job of working in a government position. Just think about that - she's eighteen, and she is an elected official! While I do not in the least envy this girl's job - especially not in view of the diatribe she is sure to receive for being only 18 - her story is a wonderful example for America. What's the lesson here? Young people can make a difference! I've posted in the past about Sam Woolf, a seventeen-year-old contestant for American Idol; and Elizabeth McKinney, an eighteen-year-old about to publish her second book. Now I can happily add Saira Blair to my list of teenagers pursuing ambitions. Teenagers everywhere, learn from these people: you don't have to wait for graduation, college, and grad school for your life to begin. Your life begins when you begin it, and not once you've met some generic academic standards. Your life is bigger than those parameters - don't let anything hold you back! Nurida purchased a stack of new parchment and a bottle of ink. She handed them to her servant to be carried when she heard an unpleasant voice behind her. She turned around to see her third-oldest sister, Ressora, who was at least eight seasons older than she, if not more. “Then you can bargain next time I get paper,” Nurida replied. “I have better things to do than haggle over paper,” Ressora retorted arrogantly. “Then go do them and let me enjoy myself,” Nurida suggested coldly. Ressora’s icy blue eyes locked with Nurida’s emerald green. Galledor, Kiarna, Asherad, and Orlian, her four oldest siblings, never saw Nurida’s anger because they never provoked it. Her three youngest siblings—Beshinor, Ressora, and Lochuran—sometimes witnessed Nurida’s hidden fire. Ressora especially. Ressora was something of a bully and very arrogant, traits that provoked Nurida, yet she did not hate her sister. “I don’t suppose you’ve heard about what’s been happening, have you?” Ressora asked finally. “What do you mean?” Nurida asked coolly. “Clearly not,” Ressora smirked. “Never mind.” And she disappeared into the market. Fallen Rose is a thrilling, emotional story that continues the epic journey of remarkable characters and their struggle to make the right choices under intense pressure. The new characters introduced in this book add a wider view of the struggle between the humans and the elves. Lliam’s personal struggle is so well-crafted that the reader cannot be sure which side he will choose until he chooses. In short, Fallen Rose is a masterpiece—a worthy sequel to Young Falcon. I would really love to say more, but I really would not like to give away any spoilers. I'm sure Elizabeth would not thank me for that, so I'm going to close by saying that Elizabeth's readers are in for a treat! If you haven't looked at her series, you really should after you've finished browsing around my books. Remember, you can find my website, with pages on all the books and a link to order them, here. You can also find me on Amazon, Facebook, and Twitter, and you can email me at DarkwoodsBooks@aol.com. Meet a Graystone Character - Conch! I realized I haven't posted any Graystone excerpts! There will be three excerpts posted, and each one will introduce a main character. This one introduces Conch, son of Mollusk and Anamay, and younger brother to Starfish. Conch swam carefully after his chief, Eagle, down the Bakkarra River. The sea otter was clammy all over and terrified for his sister. “Who fired it? Where?” Eagle urged. The minute those words left Saline’s mouth, Conch plunged back into the undergrowth, heading for the river. Eagle had paused only long enough to tell his sister to fetch Brine and some otters who could help get Pearl back to her home before racing to catch up with Conch. They had already gone far downstream, past many willow-lined banks. Every few minutes they softly called out to Starfish, but there was no response. Conch wanted to swim frantically through the cloudy waters of the Bakkarra and shout his sister’s name, but he knew he had to be quiet and careful, or he might miss danger lurking about.